Custom Birthday Boxes Birthday box packaging is mostly used for birthday party favors supplies, and any other such item. 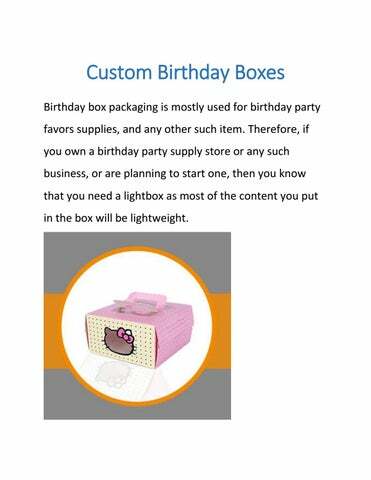 Therefore, if you own a birthday party supply store or any such business, or are planning to start one, then you know that you need a lightbox as most of the content you put in the box will be lightweight. The best box packaging option for birthdays is Reverse Tuck End, 1-2-3 Bottom, Apparel Sleeve, Gable Bag Tuck End and Four Corner Tray. However, this isnâ&#x20AC;&#x2122;t the only kind of boxes you can order. You can explore the range of boxes we offer and can then take a pick. Otherwise, we can also create an entirely custom box for you in any hope and dimensions you like depending on your guidelines. 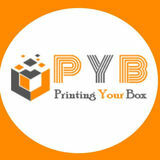 If you want, you can ask for a CAD sample or mockup to be made of the boxes you are planning to order. This way you can see how the boxes will turn out before you place the order so you can ask for any changes if needed.